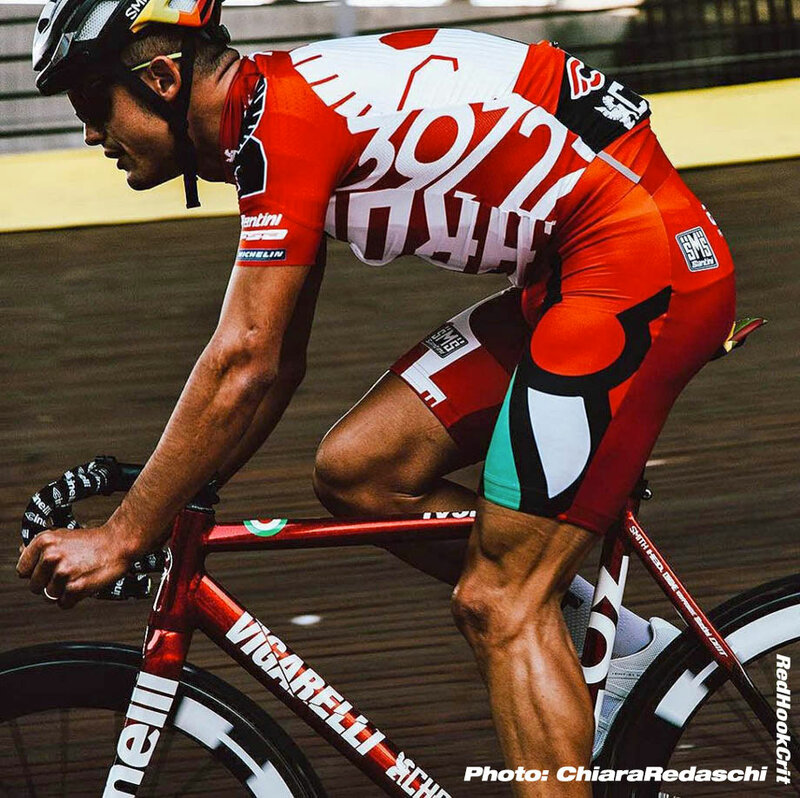 PezCycling News - What's Cool In Road Cycling : Red Hook Crit Champ Davide Vigano Gets PEZ’d! Red Hook Crit Champ Davide Vigano Gets PEZ’d! Rider Interview: What do you do when your pro career is over? Drive a team car as a DS? Chauffeur ViP’s around big races? Become a TV pundit? 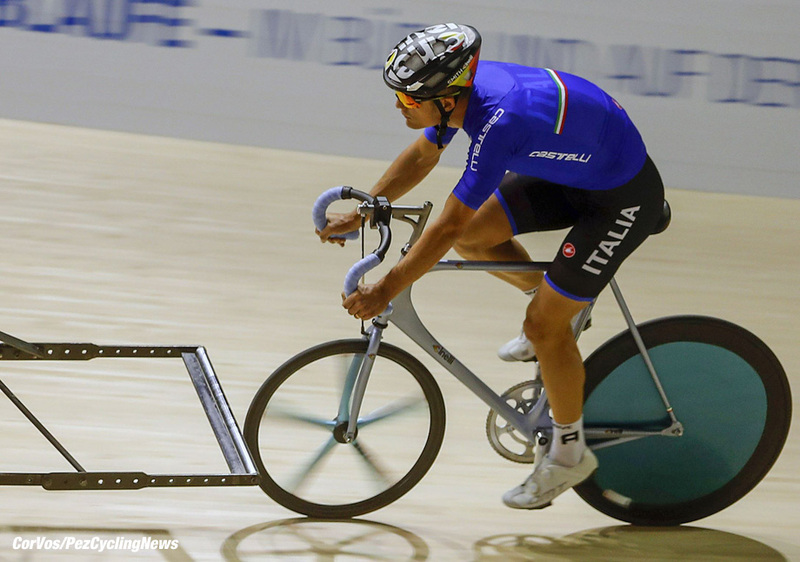 Or, if you’re ex-Quick-Step man, Davide Vigano, 'none of the above,' you race fixie criterium races. Ed Hood caught up with the Red Hook Crit series champion. Vigano was a pro for 12 years with Androni, Quick-Step, Fuji, Sky, Leopard, Lampre, Caja Rural and Team 2010. He quit last year but instead of taking any of the above soft options, he now rides the Red Hook Criterium Series for Team Cinelli Chrome. Did I mention that said crits are ridden on track bikes with no brakes? Crazy? For sure! The Red Hook series races are held in Brooklyn, London, Milan and Barcelona – all venues hot with that dope 'messenger vibe'. That’s ‘dope’ as in cool, hip and bearded – not as in Floyd or Lance, folks. 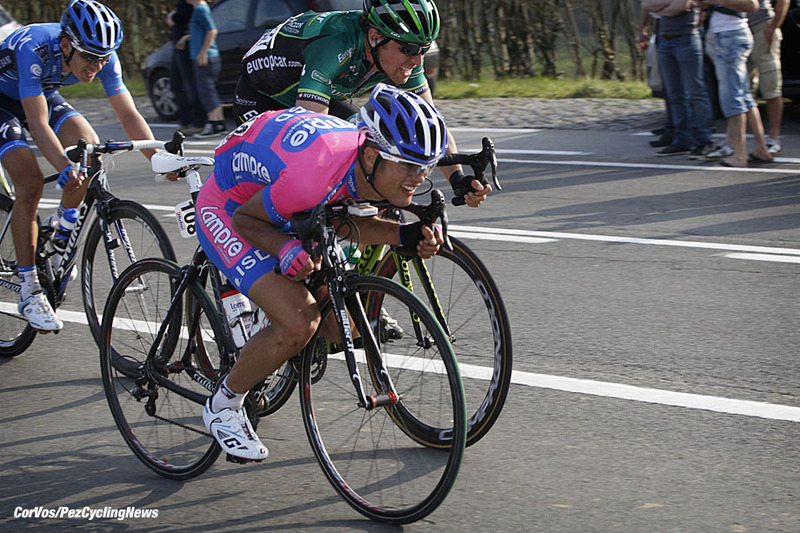 "You won't find this team on the Grand Tours or in the Classics. They live where rubber meets road, wherever there's a new energy in racing. This is a team that transcends urban landscapes and creative movements - seeing the bicycle as a form of communication. This is Team Cinelli Chrome." Quite. The series is the slicker, more formal step child of unsanctioned ‘Alley Cat’ races which cycle messengers all over the world have been riding for the last two decades. In Gent, Belgium for instance, messengers and ‘urban warrior’ riders assemble at various points around the city late at night and await a text message which gives them the finish point. It’s then up to them to get there by whatever route they like, as fast as they can, with many of them brakeless – it goes without saying that this madness isn’t too popular with the Gent Police Force. We caught up with Sen. Vigano after he’d won the Red Hook series overall with two fourth and two second places. 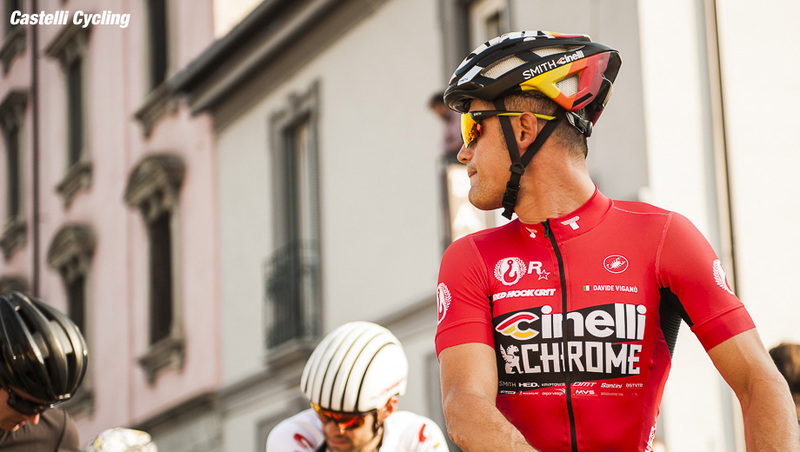 PEZ: Why quit the pro peloton, Davide? 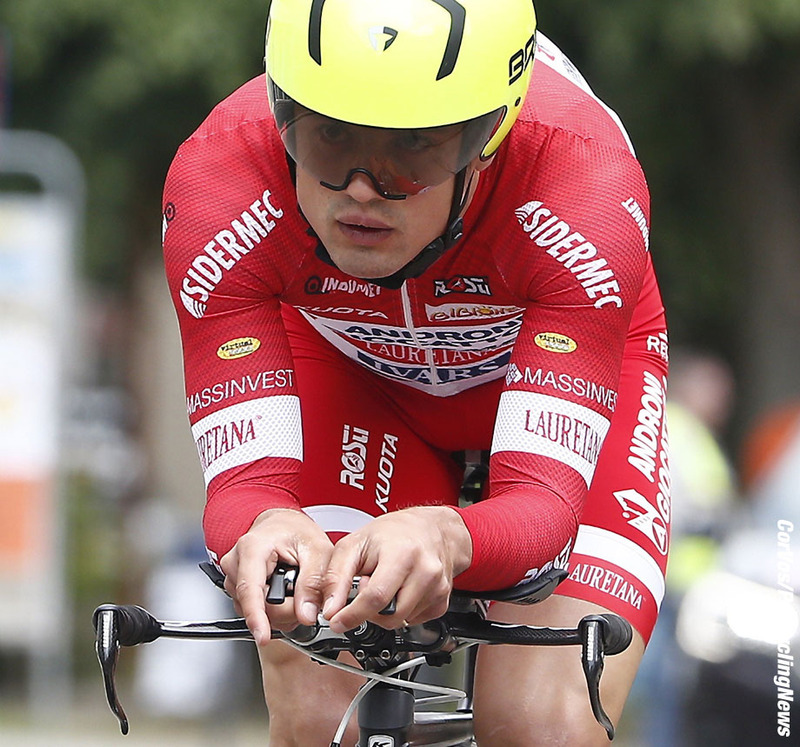 You were still competitive – 3rd in the Trofeo Matteotti, 6th in the Coppa Bernocchi and top 12 in the Costa degli Etruschi? 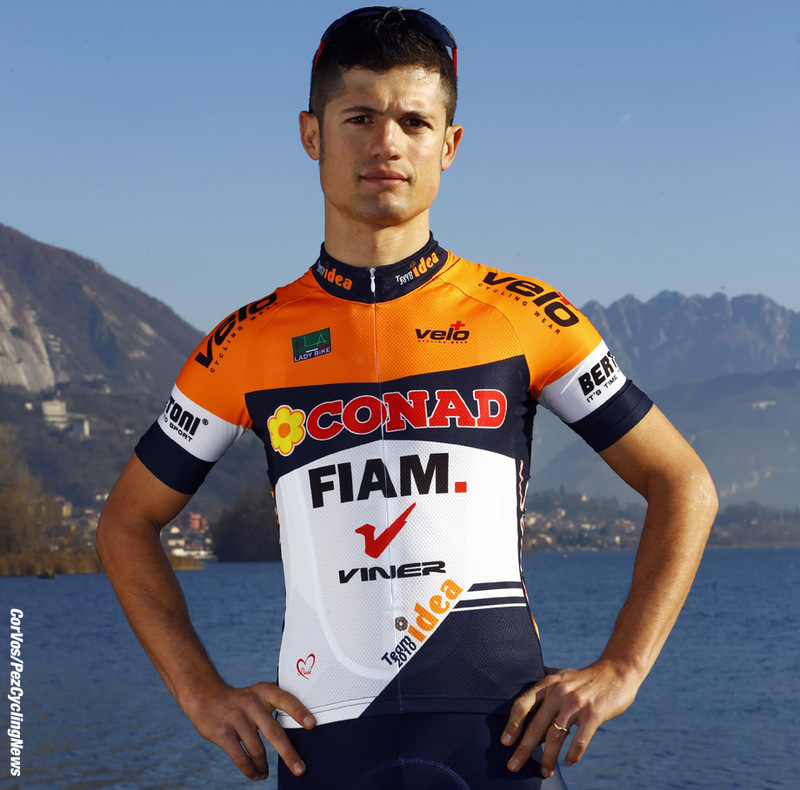 Davide Vigano: In my last year as a pro I wasn’t in a big team (Androni) and mentally that wasn’t good for me – I had a choice, I could continue in a small team or find a new solution, I chose the latter. PEZ: How did you get into the Red Hook races? I was working with Cinelli, who have a team for this type of event, and the boss asked me to consider riding them. The idea certainly tuned my head! PEZ: They look totally crazy; lots of corners but NO brakes? Yes, but I was originally a track rider so riding fixed wheel isn’t something totally new for me. And I was a sprinter so I don’t have fear – and it was something new for me. I’m sponsored by Cinelli bikes and Barrage who make back packs and the like. PEZ: So a Cinelli frame for sure? Yes, a Vigorelli with high bottom bracket and 170 mil. cranks; that’s short for me, I usually ride 172.5 mil. We ride HED carbon wheels with Michelin tyres. PEZ: Tell us about your training. I train like I did when I rode World Tour but with much more threshold work on the flat, there’s no point in climbing hills so much; that makes you lose your speed. PEZ: You started out as a track man? Yes, I rode the track all of my cycling life but not so much as a professional. In Italy it’s hard to get to ride the track as a pro, the team managers think it’s too dangerous and the road season starts so early now with Down Under and the Desert races. PEZ: Of all the pro teams you rode for, which was your favorite? 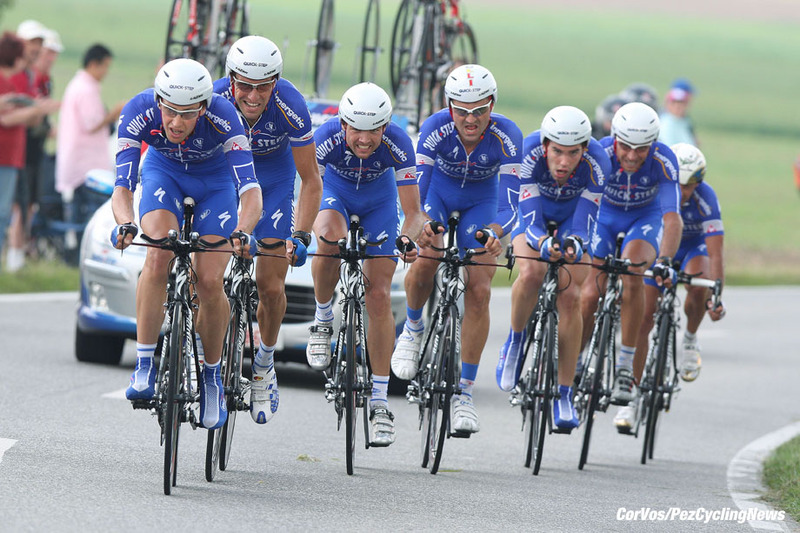 I rode four season with Quick-Step, one of the best teams in the world. Those times were super good with Tom Boonen and Paolo Bettini. PEZ: What was Monsieur Lefevere like as a manager? A great manager and a good person, a man you can speak frankly with. PEZ: What about Bradley Wiggins at Team Sky? For me he was Doctor Jekyll and Mister Hyde; either full of smiles or super serious! I felt I was unlucky with Sky, I was a lead out man but they were looking for GC guys. . . Leopard wasn’t the best either, there were so many changes half way through the season. 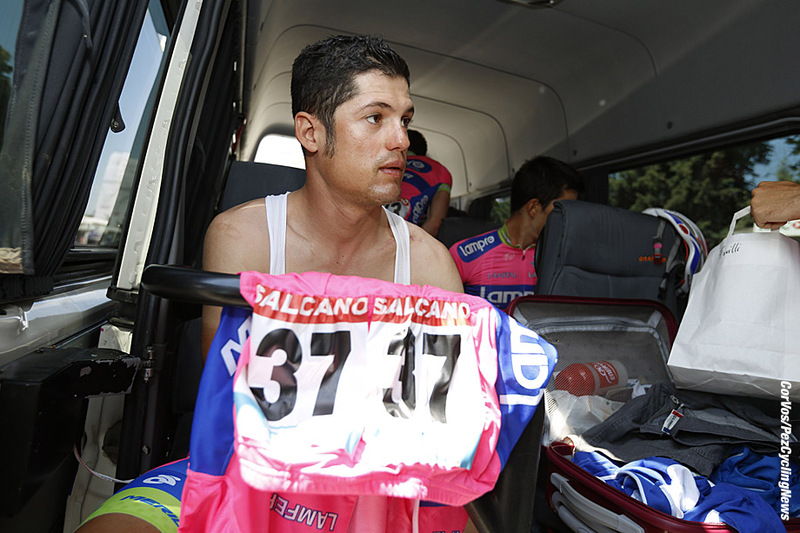 I was two years with Lampre, which were good but by then my career was on the way down. PEZ: What was your favorite race? The Giro, the mountains are unique – climbs like the Stelvio and Mortirolo are so special. In terms of organization the Tour is the best, for the fans and the media too. 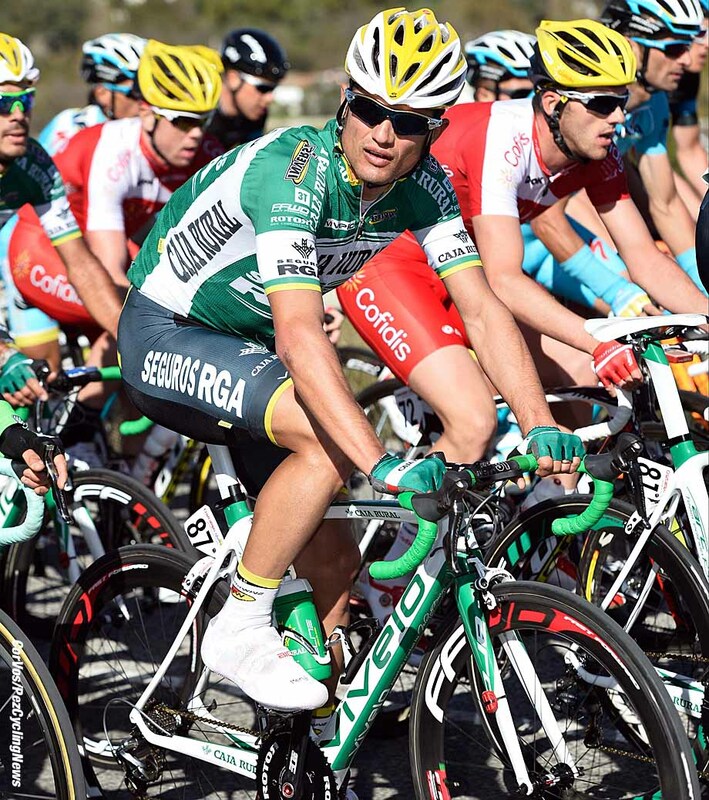 I really liked the Vuelta though, I was always at my best at that time of the season; I rode it eight times. PEZ: What do you rate as your best pro performances? I was happy when my team mates won – that was my job, to be a domestique. I had a few wins of my own but not in big races; I won in the Tour of Portugal for example. PEZ: What does the 2018 season hold? I want to continue with the Red Hook series, it’s a new sport; fixed wheel criteriums but it’s gaining ground with races all over the USA – and I’d like to ride on the track. PEZ: If you had your career over? I’m not super happy with my career; when I didn’t have a contract for the next season I could ride well – I just didn’t believe in myself enough. When I looked back I don’t know why I stopped when I did! It was November 2005 when Ed Hood first penned a piece for PEZ, on US legend Mike Neel. Since then he's covered all of the Grand Tours and Monuments for PEZ and has an article count in excess of 1,500 in the archive. He was a Scottish champion cyclist himself - many years and kilograms ago - and still owns a Klein Attitude, Dura Ace carbon Giant and a Fixie. He and fellow Scot and PEZ contributor Martin Williamson run the Scottish site www.veloveritas.co.uk where more of his musings on our sport can be found.